Interest seems to be ramping up for a great idea right now: The Crappy Dinner Party. I think there’s an extra rule: feel free to break all the rules — because really, this is about getting over all of your traditional excuses to have people over. And if you need to show off a clean bathroom or a fancy dessert to enjoy your evening, go do that. The point is to hang out with people you love. What could be better? So I thought I’d try help push the cause — with suggestions of how you can have a Gluten-Free Crappy Dinner Party. For dessert, how about some of your favourite cookies, a bowl of ice cream, or just some good dark chocolate broken into shards? 1) Sheet-Pan Chicken and Veggies: there are a couple ways you can go about this, but my favourite is to buy some pre-marinated chicken thighs (or a marinated butterflied chicken) and bake on a cookie sheet at 350F in the oven along with veggies. My latest hit has been Coconut Lime Butterflied Chicken with Roasted Sweet Potatoes and Shallots. Cut up your veg, toss with fat (olive oil, coconut oil, ghee), salt, and your favourite herbs (thyme would be good here), and put everything on one cookie sheet. Let roast until everything’s cooked, and go have a glass of wine while you wait for your guests to arrive. 2) Apple Cider and Pork Stew: once you’ve browned the meat, everything cooks in one casserole dish. I serve this alone, in big bowls. The starchy veggies inside mean you don’t need a side dish. Done and done. 3) Meatballs in Marinara Sauce: you can cook up the meatballs earlier in the day, or even the day before. Let your marinara sauce simmer away while you do other things. I am currently in love with these Turkey Meatballs as they have fennel and Mozzarella and beet greens. 4) Chili: make a pot of chili. Serve in bowls. Enjoy tremendously as you get your fill of comfort food. I happen to like it spicy with smoky Chipotle peppers: Spicy Chipotle Chili con Carne. 5) Breakfast for Dinner: seriously who doesn’t love eggs for dinner? Whip up your favourite omelettes and serve with a salad, or maybe do some Baked Eggs with Spinach and Mushrooms (I so adore that Smitten Kitchen recipe!! ), or do my favourite option: Shakshuka — eggs poached in spicy tomato sauce (ooh, and I really want to try this Green Shakshuka)! 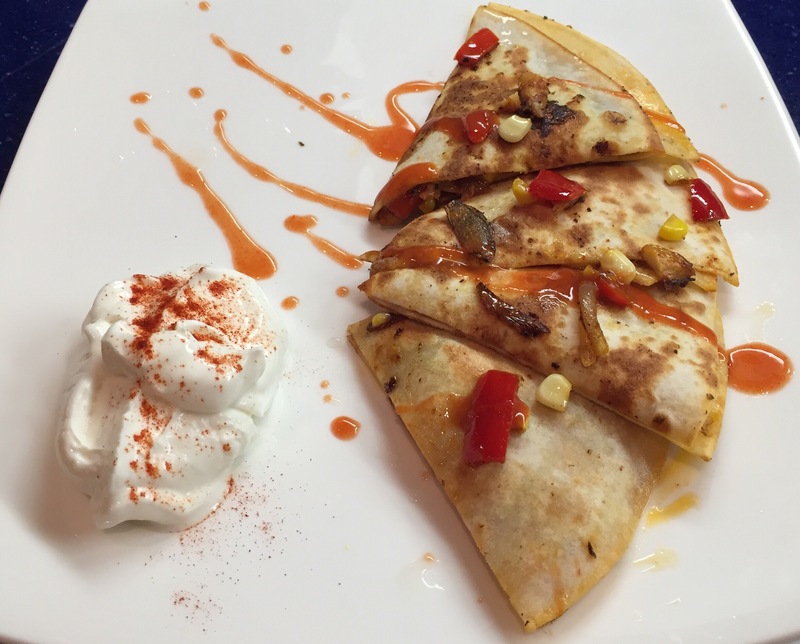 6) Quesadillas: I always keep some gluten-free tortillas in the fridge for emergencies. And stuffing leftovers + cheese into two tortillas, putting them into a pan and crisping them up, then slathering them with hot sauce is always a good idea. So why not serve quesadillas to friends? Make a big plate and serve with yogurt or sour cream and enjoy! 7) Charcuterie Platter: this is a great excuse to put out all your pickles. All you need is a lovely board, and you can top it with cold cuts, salumi, roasted chicken, pâté, pickles, fruit and jams. Yum. 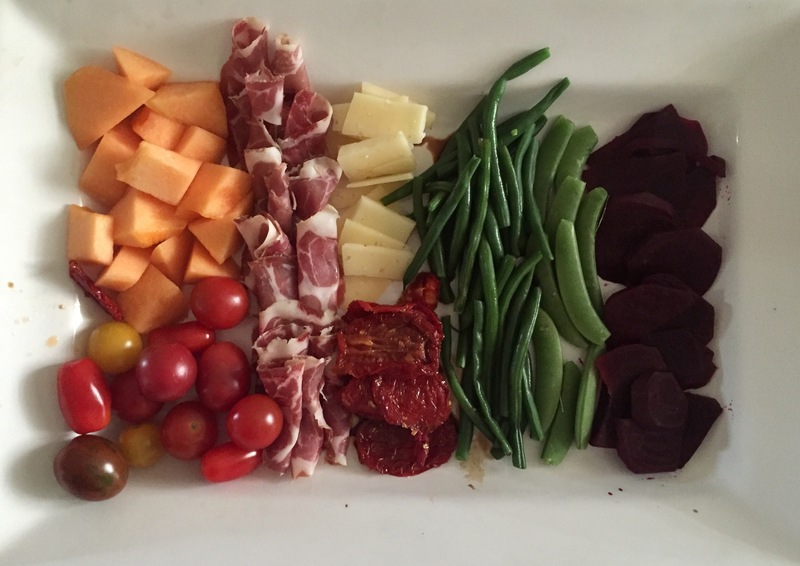 8) Antipasti Plate: much like the charcuterie plate, but with more veggies — I like to include steamed green beans, pickled beets, prosciutto and melon, sundried tomatoes, and maybe some olives! 9) Roasted Chicken & Veggies: this is probably the scariest sounding idea… but if you’ve roasted a whole chicken you know it’s actually not a big deal, and it’s really not a lot of work! I follow The Kitchn’s guidance for How to Roast the Perfect Chicken — essentially you just put a bed of veggies (potatoes, onions, and carrots work great!) down in a pan, top it with a butter-and-salt-rubbed chicken and roast it (for about 50 minutes) until a thermometer in the thickest part of the thigh reads 165F (and the juices run clear. The drippings will season the veggies while you get other stuff done. If you don’t want to roast your own, buy a rotisserie chicken and some potato salad and you’re golden! 10) Takeout: okay, it’s not a recipe… but if cooking is what is keeping you from having friends over, why not grab some takeout from your favourite local spot? I hope this gets you entertaining more at your own place. Now who wants to come over to mine for a Crappy Dinner Party?